Sauteed Garlic Spinach on Mashed Potatoes was a happy accident! One night while cooking dinner, I was planning to pop some frozen veges into the microwave until I went to the freezer and couldn't find my veges!! OH NO what to do?! I couldn't just serve the meat and potatoes without a vege! That wouldn't be right! Right? I had to think fast - pretty much everything was ready to go! Then the light bulb went off - I had a bag of spinach! But how will it pair with mashed potatoes? That just sounded weird to me, but whatever, I was desperate. No time to get picky now! I threw a couple tablespoons of butter in a skillet. I minced up some garlic and tossed it in the pan for about 30 seconds until it started smelling so yummy - then I threw in the entire bag of baby spinach with a pinch of salt and cooked it until wilted and yummy! Because I had to do all that extra work cooking the spinach, the lazy cook came out in me. I put the potatoes in a serving dish and realized I had that extra pan to clean (because of the spinach), and I started to feel a whine coming on... "I don't wanna clean another dish just to put this spinach on the table! whaawhaa" Light bulb number 2 of the night! I'll just put the spinach on TOP of the potatoes!! Sure - why not? "Honey, look how pretty the potatoes look with the spinach on top!" The hubs looked at me like I was crazy, but being the good sport he is he went along with it... (but, seriously, what choice did he have??) 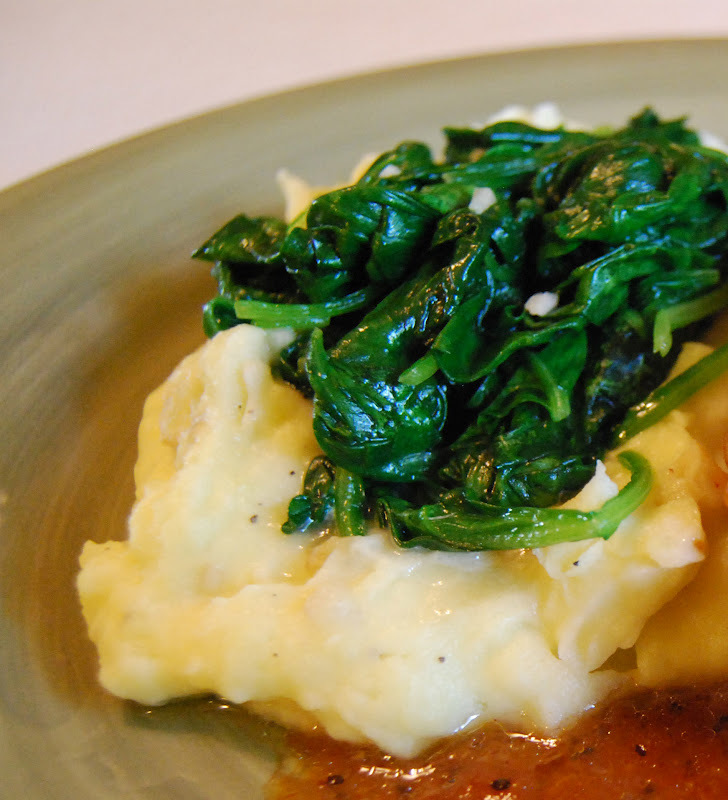 Ever since that fateful night (oh brother) we have been eating our potatoes with sauteed garlic baby spinach because it turned out to be a taste sensation! We absolutely LOVE it! Place cubed potatoes in a stock pot and cover with water. Add 2 teaspoons of salt and 4 whole garlic cloves. Boil until fork tender. Drain potatoes (don't let those garlic cloves jump out of the pan - you want to keep those with the taters!!) Put 1/2 stick of butter into the stock pot and then put the drained potatoes on top of the butter. Warm the milk and add about 1/2 the milk to the stock pot (I use heavy whipping cream in place of milk when I have it on hand). If you like them mashed really well, get out your hand mixer and mash those taters up! Add more as needed to get to your desired consistency. I like to add the milk a little at a time, so as not to end up with mashed potato soup! That is the worse! Salt and pepper to taste. While potatoes are boiling start the spinach. Heat a skillet on medium heat and melt 2 tablespoons butter. Add 1 tablespoon freshly minced garlic and saute for about 30 seconds until it starts to smell oh so yummy! Add the spinach (all 10 ounces of it!) and a pinch of salt. Saute until wilted and sweet tasting. Adjust salt to taste and pepper if you like. ENJOY! 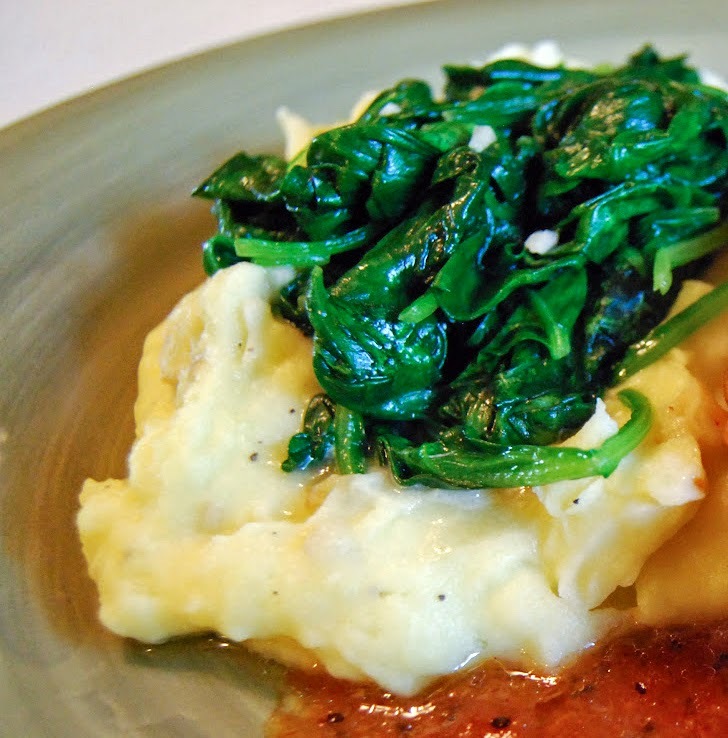 Transfer the potatoes to a serving dish and put the sauteed spinach right on top! OOOH it is sooo pretty! You might also enjoy this wonderful Loaded Potato Salad by my friend Heidy of The McCallum's Shamrock Patch.